The definition of going green varies from one person to the next depending on the level and extent to which they wish to carry on a green lifestyle. Some people believe they must jump into a completely green way of living all at once. While the sentiment is a good one, this approach can be problematic. 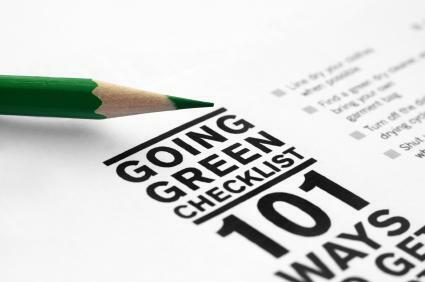 Since is virtually impossible to convert a fully green lifestyle all at once, it's generally better to make a few changes at a time. To go green means you opt for a sustainable and renewable way of living. A green lifestyle focuses on reducing, reusing and recycling whenever possible. Going green is a gradual process of changing your lifestyle by using products that are considered to be green and ensuring that you reduce the imprint you and your family leave on the environment. What Is the Criteria for Green? There are many and often varied criteria for dubbing something as being green, depending on the product. Apparel and home fashions: Organically grown fibers used in making apparel and various home fashions are processed without harsh chemicals. In addition, those products should ideally be manufactured by using eco-friendly methods only. Fair Trade: If you wish to take this green consumer support even further, then you want to look for Fair Trade products. The Fair Trade label was created as a way to ensure that artisans in developing worlds making a product can also earn a fair wage. Fair Trade certification also promotes sustainability and the ability to compete at a fair market price. This certification assists in elevating the standard of living for those in a depressed economic region of the world, while supporting sustainability. Organic foods: Organic foods are grown using natural fertilizers, non GMO (Genetically Modified Organisms) seeds and other organic farming methods. When shopping for organic foods, look for the official Certified Organic label. Products that carry this label must adhere to strict growing regulations and inspections. If you decide to grow your own organic food, the starting point is your seeds. Purchase certified organic seeds that aren't GMO or hybrid. Renewable and sustainable energy: Energy forms that are renewable and sustainable, such as solar, wind, hydro, geo-thermal and biomass are all considered to be green energies. It isn't enough that you change products. While this is a great first step, going green requires a new way of thinking. You must modify the way you look at the world, especially as a consumer and foremost as a wannabe Earth steward. The transformation from a typical average consumer to a consciously green one is truly a process that evolves as you learn more and more about this type of lifestyle. Each person must decide what level of a green lifestyle she desires and then make a commitment with a realistic timetable for reaching that goal. If you wish to make a complete conversion to a green lifestyle at the highest level of living in a green home, producing your own energy and being off-the-grid, then you must take it one step at a time. There are several reasons for making your changeover to a green lifestyle a gradual process. First, there is a lot to learn and even more to unlearn. The green lifestyle terminology is very different. When you make simple purchases, you want to look for a different set of criteria than you currently do. For example, when you want to buy organic produce you typically want the official organic label. However, there are some instances when you might purchase locally grown organic food that isn't certified. Don't let this lack of certification scare you off from buying if you know for certain that the grower honestly practices organic growing principles. Certification is costly and usually not something that a local grower, who is growing organic vegetables in her backyard, is going to seek out. You will discover quite a few uncertified organic growers at local farmer markets. That's because many people who are growing organic vegetables in their backyards take their excess produce to a local market. Buying locally is one of the first green principles you'll learn and not just for organic produce. Whenever you shop, try to buy locally. If you order something and it must be shipped to you, then you are increasing the demand for fossil fuels just to get the product delivered to your home. Sometimes you can't find what you need in your local area. In such instances, if you have to travel to another city or several surrounding towns before you can find the product, this simply isn't a logical or practical way to shop. You end up spending more on fossil fuels to travel to the city and end up losing a great deal of time. While the goal should always be to support local businesses, chances are you'll need to have some items brought in. The biggest challenge is to reduce the cost of shipping and to shop wisely. Don't feel guilty about items you can't buy locally. If you make sure that your purchases are green, you are still supporting green commerce. One of the first things many people believe they must do when building a green home is to build a LEED (Leadership in Energy and Environmental Design) home. While this is a great achievement, it isn't always practical. There are quite a few types of homes you can build that are green, yet won't fall under the LEED certification. If you aren't building, but remodeling or renovating, then you can use green construction practices to step deeper into your green commitment. There are many little steps you can take to understand the definition of going green from household recycling to purchasing an electric car. It all starts with taking that first step.